Hostel is a film so ridiculous, so filled with unbearable lapses in logic, and so devoid of anything remotely based in reality that it exists in my mind solely as a tawdry blueprint of how not to construct a horror film. The amazing box office popularity of this dreck keeps me up at nights, and the fact that a sequel is on its way to theaters in 2007 is more frightening than anything conjured here by writer/director Eli Roth. Roth crafted the so-so if mildly entertaining Cabin Fever, but with Hostel, he seems intent to outcrap even the likes of Paul W. S. Anderson. The film opens with the garish exploits of American backpackers in Amsterdam played by Jay Hernandez and Derek Richardson, as well as their European tag-along played by Eythor Gudjonsson. The trio drinks, smokes, and bangs their way through town with misogynistic glee. Filled with vile, often homophobic dialog, awful acting, and gross behavior, these opening scenes are classless and embarrassing. The group is soon informed by a local that in Slovakia, there exists a hostel where girls sit around waiting for American tourists to sleep with them. Sure. 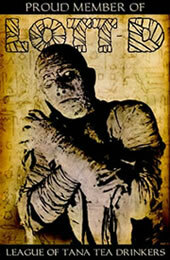 In actuality, the hostel is the scene of mysterious disappearances and strange occurrences. Once the boys arrive at the hostel, one might expect (based on the film's trailers) a nightmarish descent into a tortuous lair run by depraved psychopaths. But no. Roth spends a good hour (at least) setting up a lethargic plot, sketching characters whose personalities wouldn't impress the guy who sold you pot in college, and foolishly creating a mystery that -- in capable hands -- might produce some sort of suspense. Erstwhile, very little actually happens, even when some of the hostel's more sticky secrets are revealed. I'm all for the slow build up of tension found in such great horror films as Halloween and The Shining, but here it's all build up and no tension. 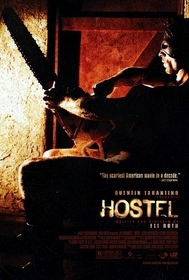 Hostel is the one thing that no horror film ever, ever wants to be: boring. As a film promoted by Quentin Tarantino as a ghoulish and macabre showcase, there's very little gore, shocks, or scares. In fact, I was completely caught off guard by how mundane the violence is. I expected some scenes of torture and mayhem that might test my gorehound sensibilities, but what I got were a lot of cut aways, cartoonish limbs, and dreary "seen this a million times" set pieces. So, is there anything to recommend? I did enjoy the basic concept of the film. And the deeper implications of the hostel's seedy underbelly are interesting, especially considering the current, sad state of United States foreign relations. But I don't buy that the surviving characters understand the implications of the plot, or, for that matter, how their lecherous actions led them to the violent confrontations of the film's third act. It's a shame, too, because in the right hands, this story might have gone somewhere, and been a horror film filled with social commentary a la Romero's Dawn of the Dead or Craven's New Nightmare. As-is, it's a low rent mess. Submitted by Wayne (not verified) on Wed, 2010-10-06 08:40. Good review! I HATED "Hostel" with a passion. Aside from being incredibly mysogynistic (even for a horror film) it was homophobic and has two main characters that you hate. And it is true--the violence was pretty tame. They did up it in the sequel (which I was forced to see by "friends") but the sequel was even stupider than the first! Submitted by Xin Qian (not verified) on Wed, 2013-04-10 02:28.